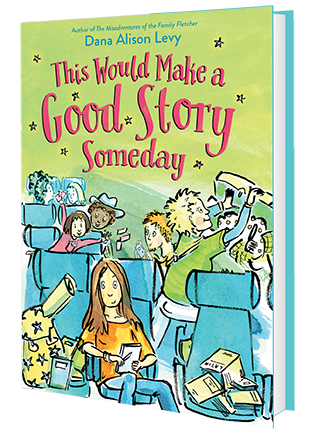 Dana Alison Levy is the author of This Would Make a Good Story Someday, a new novel for kids. 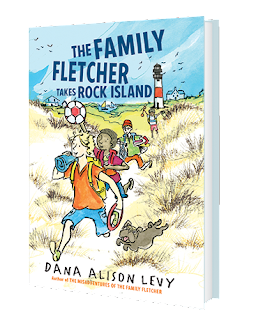 She also has written The Misadventures of the Family Fletcher and The Family Fletcher Takes Rock Island. She lives in Massachusetts. Q: How did you come up with the idea for your new book, and for your main character, Sara? 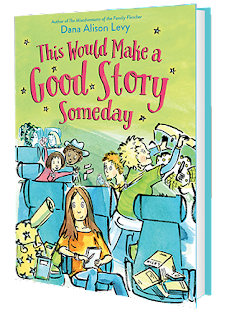 A: There was no one “ah-hah!” moment with this book, but rather a quieter series of “what if” moments. 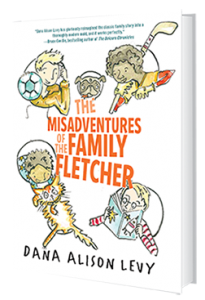 What if I write a story about Ladybug’s family (she’s a secondary character from The Misadventures of the Family Fletcher, for those who don’t know!). What if it’s told from her 12-year-old sister’s point-of-view? What if they are taking a family trip? So Sara already existed, because I mention her (in I think only one line, almost at the end of Misadventures). But everything else just followed. Q: Did you need to do much research on the cities Sara and her family visit in the course of the story? A: I really did! I wish I had thought to take a cross-country train trip with my family and written it all off as a work expense, but unfortunately, that wasn’t in the cards. Instead I spent a lot of time on the Amtrak website, looking at train routes, reading station guides and tourist information. I also used a number of guidebooks about train travel. And finally I had them travel to some places where I had actually been myself. All of the “Fun Facts” in the book should be true. I say should, because while I found them in guidebooks and train guides, I didn’t double and triple-check every detail! Q: The story is told in various ways, including diary entries and postcards. How did you decide on the format? A: Deciding to have the book be in the form of Sara’s journal was a lot of fun, but also really limiting. Even allowing for a nice big dose of suspension of disbelief, I had to be thoughtful about what a 12-year-old might realistically notice and write about. And therefore, by its nature, her journal entries don't allow certain perspectives. That’s where Mimi’s writing and Laurel’s blog came in. They offered a wider view of the world the family was navigating, and a way for Sara (and readers) to be aware of some of these other elements. And the postcards from Ladybug to Frog were just for the sheer fun of writing them. Q: Who are some authors you particularly admire? A: Oh wow…that’s an impossible question. Because there are literally hundreds of authors I could name. But some of the authors whose new books I pretty much buy automatically include: Grace Lin, Jason Reynolds, Jeanne Birdsall, Jacqueline Woodson, Rita Garcia-Williams, and many more. On the Young Adult side, it would be Melina Marchetta, Jandy Nelson, Laini Taylor, Jesse Andrews…I could go on and on! A: I am working on a new book that will be for slightly older kids, but still in the upper middle grade realm. It will be out in 2018, but I can’t talk about it yet! A: I think last time I told you I can wiggle my ears, which is a hard act to follow. But here goes: I have double-jointed thumbs and rarely lose at thumb wrestling! --Interview with Deborah Kalb. 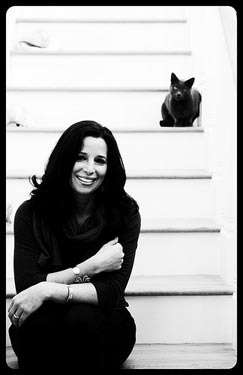 For a previous Q&A with Dana Alison Levy, please click here.